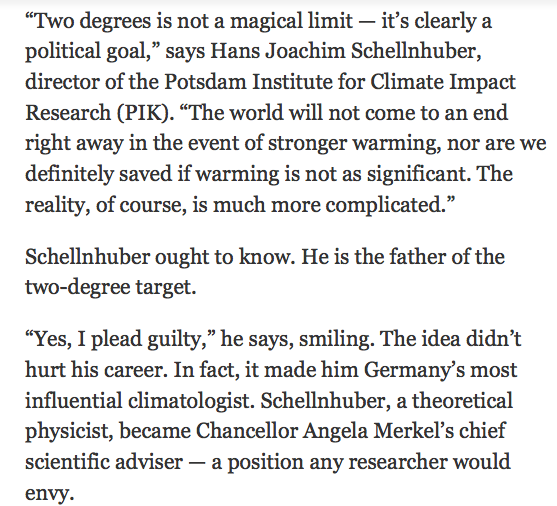 Hans Joachim Schellnhuber, a top German climate scientist who helped establish the 2-degree threshold, stressed it was a policy marker: “Two degrees is not a magical limit — it’s clearly a political goal,” says Hans Joachim Schellnhuber, director of the Potsdam Institute for Climate Impact Research (PIK). “The world will not come to an end right away in the event of stronger warming, nor are we definitely saved if warming is not as significant. The reality, of course, is much more complicated.” Schellnhuber ought to know. He is the father of the two-degree target. “Yes, I plead guilty,” he says, smiling. The idea didn’t hurt his career. In fact, it made him Germany’s most influential climatologist. Schellnhuber, a theoretical physicist, became Chancellor Angela Merkel’s chief scientific adviser — a position any researcher would envy.